What is measured: Kynurenine (Kyn), kynurenic acid (KA), anthranilic acid (AA), 3-hydroxykynurenine (HK), xanthurenic acid (XA) and 3-hydroxyanthranilic acid (HAA), picolinic acid (Pic), quinolinic acid (QA), nicotinic acid (NA), nicotinamide (NAM), N1-methylnicotinamide (mNAM). What is measured on the same platform, click here. The amino acid tryptophan is catabolized mainly through the kynurenine pathway, forming metabolites collectively referred to as kynurenines. Some kynurenines are neuroactive compounds with immunomodulatory effects. The intial step in this pathway, the conversion of Trp to Kyn, is catalyzed by indoleamine (2,3)-dioxygenase (IDO), which is activated by pro-inflammatory cytokines, like INF-gamma and TNF-alfa. Kyn is converted to HK by the FAD-dependent kynurenine mono-oxygenase (KMO), and then cleaved to HAA by the pyridoxal 5´-phosphate (PLP)-dependent enzyme, kynureninase (KYNU), which also catalyzes the conversion of Kyn to AA. The PLP-dependent enzyme kynurenine transaminase (KAT) catalyzes the formation of two end-stage metabolites, KA (from Kyn) and XA (from HK) (2) (Figure 1). The downstream metabolite, QA, is converted to nicotinic acid mononucleotide, which is a precursor of niacin and nicotinamide dinucleotide (NAD), i.e. B3 vitamers. NAM in plasma and mNAM in urine are potential markers of vitamin B3 status. Kynurenic acid (KA) and picolinic acid (Pic) are considered as neuroprotectants, whereas 3-hydroxykynurenine (HK) and quinolinic acid (QA) have neuroexcitatory effects (Figure 1). These kynurenines are suggested to be involved in the pathogenesis of some neurodegenerative and neuropsychiatric diseases (2). The CSF levels of neuroprotective kynurenines, KA and HK, show no change (KA) or decrease (HK) with age, whereas the neurotoxic kynurenine, QA, in CSF shows a remarkably strong positive associations with age, but also with markers of neuroinflammation, like neopterin and KTR. These age-related changes may be associated with increasing incidence of neurodegenerative diseases with age (3). Lower limit of detection (LOD): 0.4-20 nmol/L. Within-day CV: 2-17 %; between-day CV: 5-17 %. Assessment of immune activation, and links to vitamin B6 status and niacin (B3) formation. 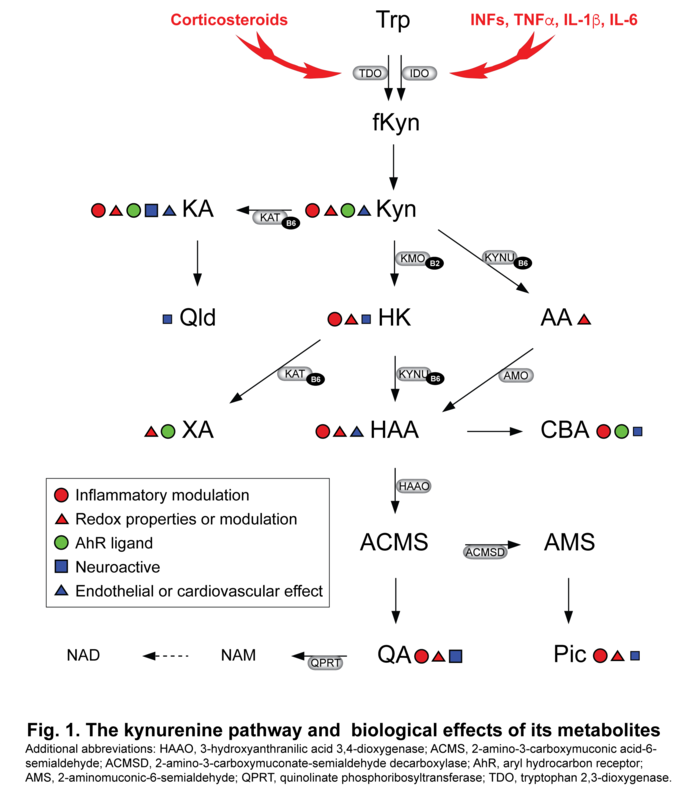 3-Hydroxykynurenine (HK) and the HK/XA ratio are metabolic markers of vitamin B6 status; HK/XA provides superior discrimination, and is less influenced by inflammation and kidney function than HK. Measurement of neuroactive kynurenines in CSF may reveal their possible role in the pathogenesis of neurodegenerative and neuropsychiatric diseases. Matrix: EDTA plasma (preferred) or serum. 3-Hydroxykynurenine (HK) and 3-hydroxyanthranilic acid (HAA) decrease (up to 40-70%) whereas anthranilic acid (AA) and in particular nicotinamide (NAM) increase (AA, up to 30%; NAM, up to 300 %) in samples with hemolysis. Volume: Minimum volume is 60 µL, but 200 µL is optimal and allows reanalysis. Preparation and stability: The kynurenines have different stability. Kyn and KA are stable, whereas HK and HAA decrease while AA increases during storage of serum/plasma samples. Samples should be put on ice immediately after collection and stored at -80 °C. Transportation; for general instruction on transportation, click here. Intraclass correlation coefficient (ICC): Kyn: 0.68; KA: 0.68; AA: 0.64; HK: 0.62; XA: 0.58; HAA: 0.54; Pic, na; QA: na; NA: na; NAM: na; mNAM: na. 1. Midttun, O., Hustad, S., and Ueland, P.M. (2009). Quantitative profiling of biomarkers related to B-vitamin status, tryptophan metabolism and inflammation in human plasma by liquid chromatography/tandem mass spectrometry. Rapid Commun Mass Sp 23, 1371-79. 2. Ueland, P.M., McCann, A., Midttun, Ø., and Ulvik, A. (2017). Inflammation, vitamin B6 and related pathways. Mol Aspects Med 53, 10-27. 3. de Bie, J., Guest, J., Guillemin, G.J., and Grant, R. (2016). Central kynurenine pathway shift with age in women. J Neurochem 136, 995-1003.